Jackie Chan sited this one – his second collaboration with movie mogul Lo Wei – as his first “dream project”, in that he was to have some say in the film’s production. 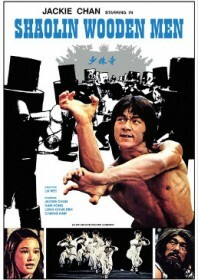 But Lo Wei still does Chan a disservice by casting him as a mute, nicknamed ‘Dummy’, who struggles as the new Shaolin recruit until he receives martial arts training from a nifty levitating nun and a crazy long-haired convict imprisoned deep within the temple vaults. Our mute hero’s longing to avenge his father’s death adds an extra dimension to the story, but he must first tackle the wooden dummies guarding the Shaolin exit. The action is gripping and Chan’s charisma still shines through despite his silent character. But the end result isn’t quite the “dream project” Chan was looking for.